The right window blinds will provide you the privacy, allow light control and enhance the beauty of your room at the same time. This is why Impress Blinds is here to provide the best window covering solutions that will make your space more comfortable and relaxing. Whether you’re looking for the window treatment for the entire house or just want a perfect covering solution for your conservatory, we provide you the custom made to measure blinds for your home in Bury (Greater Manchester) and all over the UK. You can choose from our extensive line of cheap window blinds including vertical blinds, metal Venetian, vision and Velux blinds, roller blinds, conservatory blinds, wood and Roman blinds. 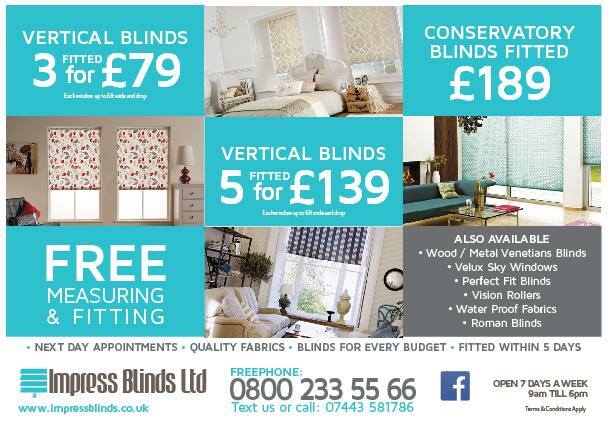 We impress Blinds deals with high quality cheapest window blinds products and we’re committed to providing exceptional window blinds services to all our clients in Bury, Greater Manchester and throughout the UK. Due to our quality vertical & roller blinds products, best covering solution and exceptional services, our valued customers have been coming back to us to buy right blinds for their home and office. With multiple colour, pattern, design and texture options, you can personalize right window blinds that will give a unique look to your room. Free fitting services for all clients in Burry and all over UK on your selected day.